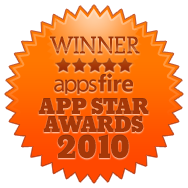 Freshly funded mobile app discovery startup AppsFire has handed out some App Star Awards to a number of developers of unlaunched iPhone / iPad applications this morning at the 360iDev conference in San Jose, California. This was the second edition of the App Star Awards – the first one was held at the Le Web conference in Paris last year (check out the winners of the first edition). This year, the winners received a free ad campaign with a good number of online publications, a brand new iPad and a 3 months worth of Animoto Pro. AppsFire received more than 80 submissions for unreleased applications in 5 days, from developers in 20 countries, including Japan, Spain, Italy, Brazil and even Iceland. Out of those, 33 iPhone and iPad apps were pre-selected by a professional jury, and for each of the 3 categories (‘Entertainment and Fun’, ‘Games’ and ‘Utility and Other’) the overall winner and the runner-up were announced at the conference just moments ago.